War Of The Worlds Aussie-style, as small-town residents fight alien invaders in a slam-bang sci-fi epic packed with dazzling effects and bug-eyed beasties. Luke Sparke follows up his hugely enjoyable action-horror Red Billabong with a no-nonsense alien invasion epic that mixes Red Dawn into Independence Day for an explosive burst of Ozploitation sci-fi entertainment, that has proved such a big hit in cinemas down under that a sequel is already being filmed. Sparke has assembled the cream of the crop of Australian acting talent, with Dan Ewing (joined by fellow Home And Away stars Stephany Jacobsen and Rhiannon Fish) swapping the safety of Summer Bay for a small town invaded by aliens; also appearing is Temuera Morrison, from Star Wars: Battlefront II, Once Were Warriors, and soon to be seen in the big budget blockbuster Aquaman, on top form here as an ex-con who leaves jail only to run into a whole heap of trouble; Romper Stomper’s Jacqueline McKenzie, and the legendary Bruce Spence, the gyro pilot from Mad Max 2, almost unrecognisable as the towering alien leader. Featuring some memorably nasty visitors from another planet, more explosions than you can count, and a band of feisty human fighters you’ll be sure to be rooting for, this is a must for fans of invasion spectaculars like Skyline and Battle: Los Angeles. After their small Australian town is annihilated by an airborne attack, a group of civilians evade capture, only to discover they are now among the last remaining survivors of an extraterrestrial invasion engulfing the entire planet. 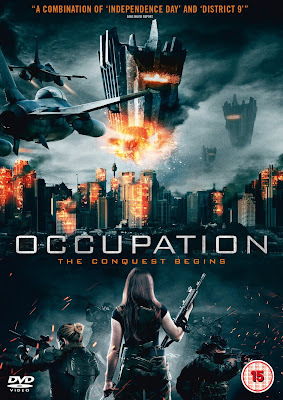 As humanity falls under world-wide occupation, the small group form a home-grown army to fight back against vastly superior and utterly merciless enemy forces. OCCUPATION is out now on DVD, Blu-ray and digital download by Altitude Film Entertainment.